An excellent phono stage at an affordable price with a purist design that includes provision for both moving magnet (MM) and moving coil (MC) phono cartridges. 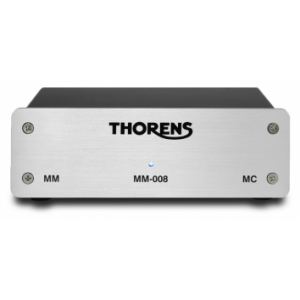 Thorens MM-008 phono stage works with both Moving Magnet (MM) and Moving Coil (MC) Cartridges, making it a great choice over the more keenly priced MM-002. Built around a high quality metal housing with brushed aluminium front panel, external power supply unit (ensures trouble-free operation) and compact size.